I was saddened to learn last week that Huffman’s BBQ in Lincoln Park closed earlier this year, so I did a search to see if San Diego has acquired any new barbeque places besides Phil’s1. The reviews of Coops West Texas Barbeque convinced me to head out this weekend. The drive to Lemon Grove is a quick one, and it was a beautiful day. They’ve got a lot of choices; we picked up two two-meat plates, knowing we wouldn’t finish them, so that we could try four meats and four sides, and have some great leftovers. We had the pork ribs, rib tips, texas sausage, and brisket. For sides, we chose potato salad, coleslaw, macaroni and cheese, and red beans and rice. The mac & cheese side was quite good, as was the potato salad. The coleslaw was more vinegary than I like. The beans and rice was average. Our two-meat plate also came with corn bread. It is not homemade but they’re honest about it, and it’s still good. Finally, while you can buy sodas, they also have unlimited sweet tea, and it’s among the better sweet tea I’ve had, both in restaurants and homemade. The meat was great, and it continued to be great the next day. The brisket was very close to the West Texas BBQ I had in February in Fort Stockton, Texas2. The sausage was homemade and flavorful; the pork ribs and rib tips were tender without being mushy. It’s definitely a place I want to go to again. Like the only other West Texas barbecue I’ve had, the meat is served without covering it in sauce; they use a dry rub. There are two sauces at the table, both very similar. One tasted slightly smokier than the other. They’re advertised as milder and spicier. I enjoyed them both; but make sure you try the meat without the sauce first—it stands on its own. It’s difficult, when eating that much good food, to save room for desert, but since Lemon Grove isn’t in walking distance I made sure to save room for one dessert. We had the peach cobbler. Very nice, very homey and warm. I want to try the buttermilk pie next time. I will definitely go to Coops again. I still need to try the buttermilk pie, the hot links, and the pulled pork sandwich. 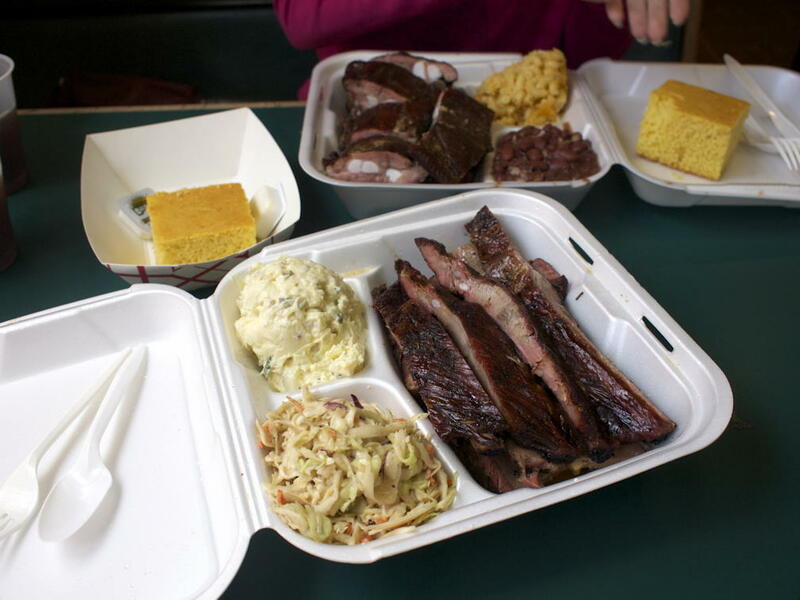 It’ll be hard not to order the brisket and ribs again, though. That’s always the problem with a really good restaurant: I find it hard to try something new because I want more of what I’ve already tried. Brad Cooper is from Midland, Texas, not too far from Fort Stockton, so this isn’t surprising. Huffman’s Bar-B-Que: Kirk K. at mmm-yoso!!! Rix Pit was a very nice surprise on our last trip from San Diego to Texas. I will be returning. “Tigger is all right really,” said Piglet lazily. “Of course he is,” said Christopher Robin. “Everybody is really,” said Pooh. “That’s what I think,” said Pooh. “But I don’t suppose I’m right,” he said. Coops West Texas Barbeque last modified May 16th, 2012.